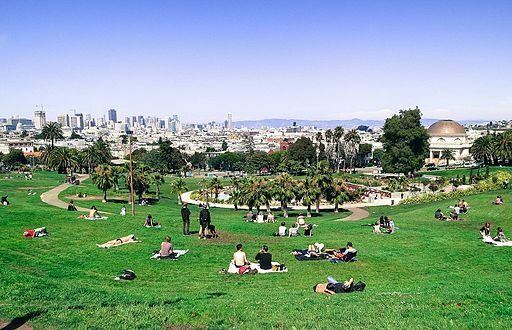 San Francisco is the first city in the U.S. to have a park or open space within a 10-minute walk for every resident, no matter where the person lives. This livable city indicator was developed by the nonprofit Trust for Public Land, which analyzes the 100 largest parks nationwide. Its annual ParkScore analysis includes the number of parks, overall spending, and facilities upkeep. Geographic mapping data is used to determine this number. According to the U.S. Department of Transportation, “the average person can walk a half-mile in about 10 minutes” on sidewalks. San Francisco has always been at the top of this list, but it moved to number one by carving out small parks in the core of the city, where there is high population density. The city has spent $355 million in bond and general fund money over the past four years to purchase land, renovate dilapidated parks and improve open spaces. In 2012, voters passed the $195 million Clean and Safe Neighborhood Parks Bond to fix up neighborhood parks. The San Francisco Chronicle yesterday wrote, “One of the advantages in cities like San Francisco is that you have lots of small parks, which makes it easy to reach 100 percent.” New open spaces include Golden Gate Park CommUNITY Garden, Geneva Community Garden, Noe Valley Town Square, SoMa West Dog and Skate Park, and Innes Avenue Park. It speaks volumes about this city’s commitment to open space. It is the reflection of literally a century and a half of decisions regarding parks and open space. In the last 10 years or so, it’s a reflection of the city’s commitment to making sure that we have the most accessible parks system in the country. Other cities atop the walkability list are New York City, St. Paul, and Minneapolis. Will a Nonprofit-Community Plan in Southeast DC Forestall Gentrification? DC’s proposed 11th Street Bridge Park, patterned after the High Line Park in Manhattan, will connect southeast DC to the rest of the nation’s capital, but poses a high gentrification risk. Can a nonprofit-community coalition keep this from happening?